This week we start the Leave Your Mark Project. 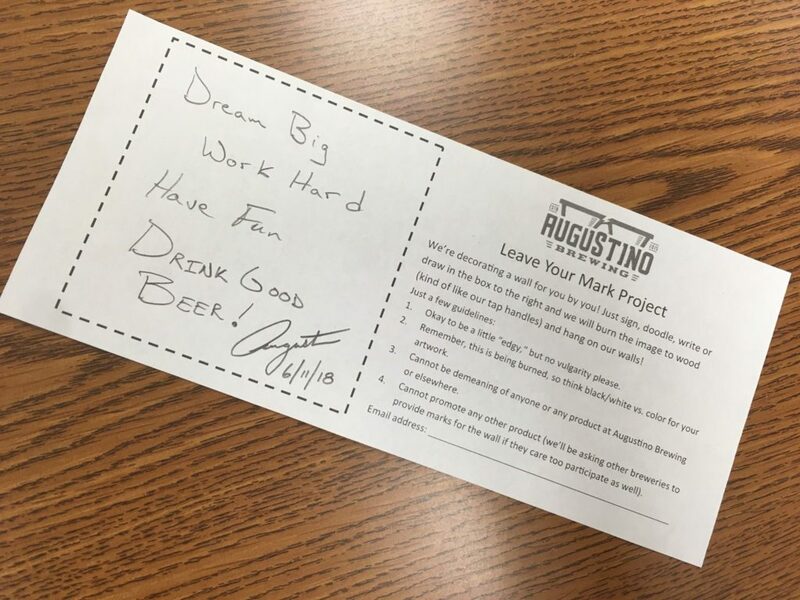 This is something we’re particularly excited about at Augustino Brewing Company. We’ve long wanted to give our guests a way to make their lasting mark on our brewpub and have decided the coolest way to do this would be to laser burn our guests’ designs to wood and create a wall out of it. So, that’s exactly what we’re doing! From now until we’ve fill the space allocated to the Make Your Mark Project, we’re letting you draw, write, and let your creativity run wild in the space we give you. We’ll then take your work to GoCreate and burn it to recycled pallet boards to hand on our walls. So, come in and Make Your Mark while you can!